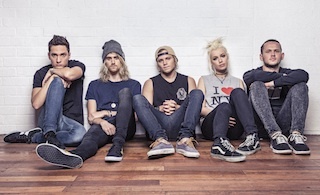 It's official: Tonight Alive will start recording their new album this month! The band confirmed the news via Facebook stating that "by mid March" the recording of their third studio album "will be well and truly under way!" You can read the full statement from the Aussie pop-rock quintet below. "Enter the full moon of Tonight Alive! All is illuminated. Rebirth awaits. Soundwave was unbelievable and truly fulfilling! Thankyou to our homeland fans for your continual support. As we find ourselves coming to the end of our writing process, we also reach the close of an album cycle. It is said that life is vibration and vibration is eternal. 'The Other Side' will live in us forever as a coming of age. It was an album that healed our wounds, brought us closer to our fans and ultimately changed our lives. But today, the next journey begins. By mid March the recording of our 3rd LP will be well and truly under way! We're excited to share that the album will be produced by David Bendeth, whose work we have admired for years and are confident will respect and channel the vision we have for the future of Tonight Alive's sound and message. We are a band that has always had so much to be grateful for! Thankyou to all who have listened to, had faith in, worked with and supported Tonight Alive throughout the past 7 years. We want nothing more than to make you happy and empower you in your lives as you do for us. We will be keeping you updated from the studio & seeing you on the road for the Future Hearts Tour with All Time Low across America from April 15 to May 24th!"